Are you interested in contributing to the rehabilitation and care of a rescued dog, but unable to adopt or foster? TBAR’s “Sponsor a Dog” program may be right for you! is a way for you to make a difference. Some of the dogs we rescue require rehabilitation, extensive medical attention and special food to get back to health. They all require vaccinations including rabies, deworming and spay/neuter before they can be adopted. Others require rehabilitation because of the abuse or neglect they’ve suffered before coming to TBAR. With extra help, we can give these dogs what they need to find their forever homes, and we can continue to rescue other dogs from abuse, neglect and other situations. Please Consider sponsoring a TBAR dog. We need both Individual and Corporate sponsors. If you can’t sponsor a dog alone, consider a group sponsorship with friends, family members or even co-workers. A donation of $75.00 per month or more entitles you to a certificate with a picture of the dog you will be supporting, an update when the dog is adopted, and your name will be listed on our web page as the dog’s sponsor. All sponsors are welcome to our Animal Care Days here you can meet your sponsored TBAR dog in-person and meet the other TBAR dogs (and horses) on-site. Join our Facebook Volunteer group to keep up-to-date on animal care days! Sponsoring a dog can make such a difference, not just for the dog you sponsor but for all the other dogs we can help due to sponsors like you! As with all donations to our rescue, your sponsorship may also be tax deductible. You can use the Paypal system to send a one-time donation, or click the box to make it a “reoccuring” donation. THANK YOU for sponsoring a TBAR dog! Your sponsorship can make such a difference, not just for the dog you sponsor but for all the other dogs we can help due to sponsors like you! As with all donations to our rescue, your sponsorship may also be tax deductible. These dogs are either in rehabilitation, or are TBAR permanent residents (because they have been categorized as “unsuitable for adoption” and they will live out their days in a TBAR foster home as we are a no-kill rescue). Thank you to the sponsors that have kindly reached out to help these animals in need! The following permanent residents have all been with us for 10 years now. Rover is a neutered male, who was a feral dog that came to us as a puppy. He was in the first litter rescued by TBAR and he was the only one not adopted. Tbar is a neutered male. He is a shy senior dog and was our first puppy intake (he was feral). Brazos: Brazos was found wandering along the Brazos River. He’s a very shy dog and needs some time to relax now that he’s safe off the streets. He is a Neutered Male, Flat Coat Retriever, Color Black. 7 Years old as of 1/2013. 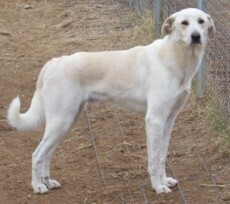 Casper (and sister Jasmine): Casper is a neutered male, Labrador Retriever / Shepherd, White with tan highlights. 7 Years as of 1/2013. Casper and Jasmine are doggy siblings that came to us as feral puppies and stayed shy. 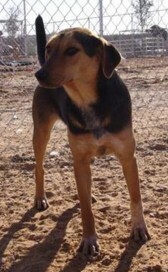 Cindy: Spayed Female, Copelyn Hound Breed, Black and Tan color. 8 Years 3 Months on 1/2013. 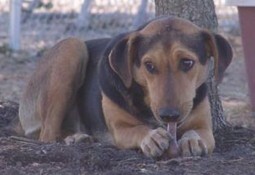 Sam: Neutered Male, Copelyn Hound Breed, Black and Tan color. Age 8 years 3 months on 1/2013. 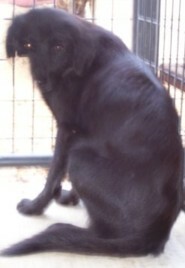 Sue: Spayed female, Copelyn Hound Breed, Black and Tan color. Age 8 years 3 months on 1/2013. Description: Cindy, Sue and Sam are are all feral dogs but enjoy getting treats from TBAR volunteers and visitors. They were abandoned by their owners when they moved and left to fend for themselves in the lot around the empty house in the country.